View Wimmera River Basin in a larger map (opens new window). 8,300 ha. 212,800 ML. Ramsar. A very large shallow lake surrounded by cleared land. Fills infrequently and only after a number of wet years. Floods occur on average every 25 years. Last filled in 1990. Dry in 2008/09. When full, contains the same species as Lake Hindmarsh which overflows into it. A very popular yabbying water when it first fills. Flows through grazing land with some larger pools carrying a few redfin. Not a popular water but may at times receive golden perch and Murray cod from the Richardson River, into which it flows. 50 ha. 4,800 ML. Boat ramp and camping facilities. Nominated by Grampians Wimmera Mallee Water as a Recreational Lake. A shallow lake (2 m) with high summer water temperatures. Has been too shallow to stock since 2002 and was dry in 2008. Contained redfin, tench and goldfish. The lake had been stocked in the past with rainbow trout. Freshwater catfish have been stocked but nothing is known of their current status. The lake was part of the Wimmera Mallee Stock and Domestic Supply System and water level fluctuated according to irrigation operations. However it will no longer be required as part of the irrigation system once the new Wimmera Mallee Pipeline is operational in 2010. It has been nominated as a Recreational Lake by Grampians Wimmera Mallee Water, and will receive a share of the water allocated to the eleven other recreational lakes. Water levels will continue to fluctuate and the lake will only be stocked with golden perch when conditions are suitable. Bostok Reservoir filled rapidly after the abundant rain in 2010. As a result the reservoir was stocked with 4,000 rainbow trout in November 2010. A deep lake surrounded by forest and located south of Halls Gap on Fyans Creek. It remains part of the Wimmera Mallee Pipeline system and will be a major supplier of water for the new system. It will be operated at full supply level although this will fluctuate depending on seasons. There are camping facilities at Halls Gap and a campground at Borough Huts just south of the lake. Non-power boating is permitted (electric motors allowed). Accessible from a road on the western side of the lake and by 4WD tracks to the other side. The lake has steep sides and deep water and remains fishable at capacity levels of 8-10%. At 17% in January 2009. Contains mainly redfin to 1.5 kg, rainbow trout to 500 g, river blackfish to 450 g and some brown trout to 700 g. Good fly-fishing on the southern shore. Sufficient brown trout spawning occurs in Fyans Creek upstream of the reservoir to support this fishery but rainbow trout are also regularly stocked. Provides good fishing for redfin. Family Fishing Lake. Picnic facilities, toilets. Located in Stawell just north of the railway station. Accessible from Napier Street. A small ornamental lake set in a park. Managed as a Family Fishing Lake and subject to stocking with advanced yearling rainbow trout (see Introduction). 1.5 ha. Also called Natural Waterhole, or Beulah Reservoir. This is a small water with a sand bottom. It was stocked with trout in the 1970s but produced very poor results. It contains small redfin. 215 ha. 6,000 ML. Boat ramp. A shallow lake surrounded by farmland, sand bottom. Light timber in the lake and some areas of aquatic vegetation. It will no longer be required as part of the Wimmera-Mallee Stock and Domestic Supply System once the new Wimmera Mallee Pipeline is operational. The preferred operating scenario for this lake was still under consideration in April 2008. Most likely, water level will continue to fluctuate and water temperatures may rise. Boats are permitted but launching is difficult because there is no ramp and there is soft sand on the shoreline. When full, carries redfin to 2 kg, trout to 3 kg and tench to 1.7 kg. 0.5 ha. Family Fishing Lake Adjacent caravan park. Located in the caravan park. Small water managed as a Family Fishing Lake and subject to stocking with advanced rainbow trout yearling once conditions improve (See Introduction). Not on the map. Small lagoon situated on the western edge of Rupanyup township. Contains redfin. Occasionally stocked with rainbow trout when water conditions are suitable. A small creek flowing through forest and grazing land, rubble, gravel and mud bottom. Runs into Lake Bellfield and then into Lake Lonsdale. There is also a diversion channel that leads to Lake Fyans. Carries some brown trout and rainbow trout to 1.3 kg, redfin to 1 kg, river blackfish to 120 g and goldfish. Last stocked with trout in 1956. 526 ha. 21,000 ML. Caravan and camping ground and a boat ramp on the eastern side. Surrounded by light forest and grazing land with excellent access from a road around the lake. This is a large, shallow, off-stream storage that will remain part of the Wimmera-Mallee water supply system after 2010, for the supply of urban water. However it will be operated at a lower target water supply level, sufficient to meet current urban and recreational water requirements. There are extensive sandy beaches. Water level fluctuates and summer water temperature can be high. A popular fishing water for redfin and trout and widely promoted as a fly fishing water. Contains redfin to 1.5 kg, brown trout and rainbow trout, tench and goldfish. It has continued to fish well even at 15 to18% capacity, although extensive beds of aquatic vegetation and low water levels can make trolling difficult. The lake was at 23% in January 2009. This is one of ten waters in which the relative effectiveness of stocking the two size groups (yearling and fingerling trout) has been evaluated. A department netting survey in July 2004 captured brown trout to 2.4 kg and rainbow trout to 1.7 kg, tench and redfin to 500 grams. All rainbow trout and 80% of the brown trout captured in this netting survey had been stocked as yearling trout indicating that the department's preference for stocking larger trout in waters known to support predators such as redfin is appropriate. Part of the Wimmera-Mallee Stock and Domestic Supply System but will be taken off-line once the Wimmera-Mallee Pipeline is operational in 2010. In future it will receive a share of the water allocated for Recreational Lakes. The lake is surrounded by farmland and is located immediately adjacent to the Highway. It is very popular with Horsham residents for general water-based recreation. When last full the lake contained redfin to 1.8 kg, a few river blackfish, tench, golden perch to 6 kg and Murray cod to 18-20 kg. Blue-green algae blooms have occurred in the past resulting in the lake being closed to all activities. A very large and shallow lake surrounded by scrub and cleared land. Often dry. Only fills after a series of wet years and then takes a number of years to dry out again. Spills into Lake Albacutya. When conditions are suitable, contains redfin av.450 g, max.1.8 kg, golden perch to 3 kg, freshwater catfish, tench, goldfish, many European carp and good numbers of yabbies. It is one of the terminal lakes of the Wimmera River and possibly may receive extra water from increased flows in the Wimmera River once the Wimmera-Mallee Pipeline becomes operational in 2010. The golden perch and freshwater catfish enter from the Wimmera River. Surrounded by crops and grazing land, mud bottom. Normally, carries mainly redfin av. 350 g, max. 1.8 kg, and possibly an occasional Murray cod. Water level is currently low. Trout stocking in the 1970s produced very poor results and was discontinued. Stocked occasionally with yearling rainbow trout for 2nd and 3rd term school holiday periods but not classified as a Family Fishing Lake because of its surface area. Has not been stocked for many years but stocking will be reconsidered once water conditions suitable. 5.4 ha. Also known as Franks Gully Reservoir. This small domestic water supply, managed by Central Highlands Water Authority, is situated 1.2 km from Landsborough on the Ararat Road. Open only to bank fishing. Please do not interfere with rock structures. Contains small redfin. Trout stocking in the 1970s produced very poor results and was discontinued. Trial stocking of golden perch commenced in 1997 but is now on hold due to low water levels. 2,630 ha. 65,500 ML. Boat ramp, camping ground. A large shallow lake surrounded by forest and cleared land. There is a camping ground at the outlet of the lake and boats can be launched at the sand bar on the northeast side of the lake. Roads run close to the northern and western shores. Evaporation rates are high, and the lake only fills in very wet years. This results in the water level fluctuating widely and often being very low. The lake will remain part of the Wimmera Mallee Pipeline System, but the operating scenario will change. There will be no transfer of water from Lake Bellfield and water level will be solely reliant on natural run-off inflows. Full supply level will be reduced to 80% capacity. Water from Lake Lonsdale will be available for recreational use in the lake, and to provide an environmental flow downstream in Mt William Creek and the Wimmera River. The lake provides very good fishing when it is full, but experience has shown that stocking is only worthwhile if two years of satisfactory water levels can be guaranteed. This has proven to be a very rare event and the lake has not been stocked since the early 1980s. The lake carries redfin to 1.5 kg, occasional brown trout to 2.2 kg, tench and goldfish. Trout spawn in the Mt William Creek, which flows into the lake. Also receives water and fish from Fyans Creek. 9 ha. 490 ML. Shady picnic area and adjacent caravan park. A shallow, tree-lined lake situated adjacent to Murtoa township. High summer water temperatures. Abundant aquatic weed makes fishing difficult. Contains redfin to 1.6 kg, tench to 1 kg and goldfish. Trout stocking was abandoned in 1978 due to poor returns. This lake will not be part of the Wimmera-Mallee Pipeline system. It is proposed that its future water supply will be restricted to an identified entitlement based on the historical supply. This will need to be supplemented by the maximum possible inflow of stormwater. This is the outlet river from Wartook Reservoir. Water is released downstream to be diverted to Horsham. Water releases flow, for several kilometres through forest. In this section, it is a small (1-4 m wide) creek with fast flowing riffles (10-20 cm deep) and slow flowing runs and pools to 200 cm. Substrate is gravel, with large boulders and sand and mud in the pools. There are numerous snags in the channel. Further downstream it flows through grazing land. Its width varies from 20-60 m and pools are from 50 cm to 220 cm deep. Substrate is mostly sand but patches of gravel, rubble and rock are also present. The river has good riparian vegetation and good quality habitat for fish. Carries brown trout and rainbow trout to 450 g, numerous river blackfish (particularly in the forested section), tench, goldfish, mountain galaxias, flathead gudgeon, southern pygmy perch and some redfin in the lower reaches. Last stocked with trout in 1968. An upgrade of the regulators controlling flow releases has been carried out, as part of the River Health Program. This improves the management of water releases, enabling increased environmental flow. Reaches of the river which have been dry for many years will now receive a flow. A fishway has also been installed on the Mt Zero channel off-take in the River. A small tributary of the upper Wimmera River containing small brown trout. Flows through scrub and grazing land on the edge of the Grampians National Park. There are numerous pools averaging 3 m in depth with a series of permanent deep pools fed by springs in its upper reaches. Substrate is mostly clay and silt, with small areas of sand. Has good riparian vegetation and instream snags which provide good cover for fish. Marginally saline at 300-1,000 EC. Contains redfin to 1.8 kg, some brown trout, river blackfish, mountain galaxias, Australian smelt, flathead gudgeon, eastern gambusia and carp gudgeon. Dadswells Bridge has a large pool and is the best area for catching river blackfish. A trial stocking of golden perch in the late 1990s was considered a failure. 41 5ha. 11,300 ML. Lakeside picnic area with barbecues and a boat ramp. This is a shallow lake surrounded by flat agricultural land and is usually very shallow or dry. It is only stocked after wet years when it is likely that depths will remain adequate for trout, for at least two years. When conditions are suitable, it provides very good fishing for brown trout, rainbow trout and redfin and is renowned for yabbies. Good bank fishing with worms and spinners. No water supply will be available when the Wimmera-Mallee Pipeline is operating. Instead, stormwater will be returned back into the Lake.Remains drought affected (2008/09). Family Fishing LakeBoat ramp, reserve area with shade trees and picnic tables. A man-made lake located on the southern side of Nhill township. Currently has low water levels and is 60 cm deep. Contains redfin and goldfish. Managed as a Family Fishing Lake and subject to stocking with advanced yearling rainbow trout (see Introduction). 734 ha. 64,000 ML. Boat ramp. Surrounded by grazing land, mud bottom. Part of the Wimmera-Mallee Stock and Domestic Supply System but will not be required after the Wimmera-Mallee Pipeline becomes operational. The preferred operational scenario was still under consideration in April 2008. There is an all-weather boat ramp at Chalky Point, accessible from the Western Highway. The banks are eroded in places and there is little aquatic vegetation. The lake was stocked regularly with brown trout until 1997, when, at the request of anglers, a change was made to golden perch. European carp became established in the lake during the 1990s and the water has become more turbid. Used to also carry redfin. tench and salmonids. A popular water fished with considerable success by Horsham based anglers. Best fishing is around the edges when the water level is rising. Located on the northern edge of Horsham. Consists of two small dams that fill from stormwater run-off. Surrounded by farmland and a road on the southern side. Managed as a Family Fishing Lake and subject to stocking with advanced yearling rainbow trout (see Introduction). 1.5 ha. Family Fishing Lake. Picnic facilities BBQ. Located in the centre of Murtoa in parkland. Contains redfin. Managed as a Family Fishing Lake and subject to stocking with advanced yearling rainbow trout (see Introduction).Also stocked with golden perch. The Richardson and Avon Rivers flow from the Pyrenees Range with the two rivers joining at Banyena. The section from the confluence of the two rivers at Banyena to Lake Buloke (a distance of 35 km) is usually called the Rich Avon River. The river system is a 'closed system' with all flow going into a terminal lake (Lake Buloke). Both rivers have intermittent flow, and flow often stops during summer. Water depth in the Richardson River is usually less than 2 m with occasional pools to 4 m downstream of Donald to Lake Buloke. The Avon River is shallower and almost dries out each year. It is highly saline with severely reduced concentration of oxygen (anaerobic) occurring during summer. The largest permanent area of water is the Rich Avon Weir (also called the Avon Regulator or Gutheries Weir). The weir wall backs up about 5 km of open, deeper water. It was constructed to receive water from the Wimmera-Mallee Stock and Domestic Supply System and to divert this either downstream in the river or into Lake Batyo Catyo. This system will no longer be required once the new pipeline is operating. Instead a special environmental flow for the Richardson River and Lake Baty Catyo will be supplied. Flows through pasture and cereal crops, clay bottom. The 5 kms of water behind the Rich Avon Weir wall has pools up to 4 m deep. It contains redfin to 1.3 kg, Murray cod to 6 kg, golden perch, European carp, goldfish, tench, possibly freshwater catfish and Australian smelt. There is excellent access on the southern side of the weir, with natural camping sites (no facilities). It is a very popular fishing area for locals. Golden perch are stocked regularly into the Rich Avon Weir. Some river improvement works are being undertaken in the Richardson River as part of the River Health Program. Flows through cropping and grazing land, mud and stone bottom. Contains redfin av.450 g, (max.1.8 kg), European carp and goldfish. Becomes saline when flow ceases. Best fishing is above the ford at the Donald Sanctuary. Forms part of the Wimmera-Mallee Stock and Domestic Supply System and is filled by a channel from the Grampians water storages. Will become redundant once the pipeline is completed. The future preferred operating scenario to supply water for Pine Lake was still under consideration in 2008. It is a long, narrow lake, surrounded by farmland. There is some scattered standing timber in the water around the margins. Contains redfin to 1.6 kg, golden perch, Murray cod and the occasional trout. Australian smelt, flathead gudgeon, tench, European carp and river blackfish have also been recorded. It is usually stocked regularly with golden perch and Murray cod but this was suspended in 2004 because of low water levels. Angler access has been improved as well as new signage, fencing and revegetation as part of the Recreational Fishing Grant Program funded by Recreational Fishing Licence fees. 1,444 ha. 106,500 ML. Boat ramp, camping, caravan park. Also called Barton Swamp. Part of the Wimmera-Mallee Stock and Domestic Supply System and filled from Rocklands Reservoir. Once the Wimmera-Mallee Pipeline is completed, it is proposed to operate the reservoir at 50% water level solely for recreational use. Mt Talbot Creek is the only major tributary. Surrounded by grazing land, mud and sand bottom. There are extensive areas of private land around the lake, but it is accessible at the northern end from Hamilton Road where there are two boat ramps and toilets. There are camping facilities including a privately run caravan park on the eastern shore. Has carried redfin to 2.6 kg, (av.1 kg), brown trout to 5 kg, (av.1.7 kg), tench to 3 kg and possibly a few rainbow trout to 2 kg. Can be fished from the bank, but a boat provides far greater opportunities. Fishing for both trout and redfin is very good most of the year in the stands of dead trees in the eastern and southern areas of the lake. Most fishing methods will take fish, but mudeyes are considered the best bait under most conditions. This has been a consistent producer of good fish since the mid 1980s until the onset of the current drought in the west of the State. The lake was only 1% full in 2004, and then dry in 2008/09. The stocking program up to 2004 had progressively changed from 50/50 brown trout/rainbow trout to all brown trout. St Arnaud town supply. Surrounded by grazing land and carries only redfin. Non-powered boats are permitted but the high banks make launching difficult. Located 2 km west of Batyo Catyo Lake. A small lake located in a Wildlife Reserve. Contained Murray cod and yabbies and provided angling for locals. Dry in 2008/09. Stocked with Murray cod when water conditions suitable. 1,030 ha. 29,500 ML. Boat ramp, toilets. Domestic and irrigation storage in the Grampians National Park and located on the McKenzie River. Will continue to operate at full supply level when the Wimmera-Mallee Pipeline becomes operational. Surrounded by forest, mud bottom. Carries brown trout av. 800 g, (max.2 kg), redfin to 2 kg, river blackfish and some tench to 2.2 kg. Boats with motors up to 7.6 kw (10 hp) are permitted. Boat owners should use caution as the storage has many submerged tree stumps, and should also respect the fact that the lake provides drinking water for a number of communities. The deepest water is at the wall and between Bear Island and the western shore. The nearest camping is at the Smiths Mill camp site which is south of the reservoir on the Old Mill Road. This is a popular fishing water but catches can be 'spasmodic'. It is worth trying a variety of baits and lures when fishing this water. Access is possible via a gravel road around the shore but most fishing takes place in the area of the wall, with good fishing during May and June. Water capacity has remained over 21% during the past 3 years (37% 2009) providing good fishing results for brown trout and redfin. Stocked regularly with brown trout. Past stocking with rainbow trout have been unsuccessful and was terminated in 1982. Family Fishing Lake. 300 m in length. Adjacent toilet and seats across the road at the rowing shed and toilets and picnic facilities in the Botanical Gardens approx. 270 m away. Walking track around the Dam. Not on the map, but located in parkland with some trees, adjacent to the Wimmera River and Watonga Drive. Near the Horsham Botanical Gardens. Managed as a Family Fishing Lake and subject to stocking with advanced yearling rainbow trout (see Introduction). The Dam will be dredged in early 2009 and then stocked as a priority post-2009 if water conditions are suitable. A rock-ramp fishway has been constructed at Jung Weir. The Wimmera River originates in the ranges of Mt Buangor State Park near Ararat. It then flows for 75 km through gentle to moderate hilly country to Glenorchy. From there it runs in a flat plain for the next 120 km and drains into a series of terminal lakes, the largest being lakes Hindmarsh and Albacutya. For almost its entire length it flows through grazing and cropping farmland. There is a small area of low mixed forest in the upper headwaters and some scrub and low mixed forest near Dimboola. The river has an intermittent and highly variable flow regime. There are high levels of salinity in the bottom of pools (5,000 EC upstream of Horsham and from 10,000 to 40,000 EC downstream). The most serious problem for fish in the river; is a combination of high salinity, very low dissolved oxygen, the presence of hydrogen sulphide and low pH at the bottom of pools, which occurs during low flow periods and makes the water toxic to biota. This results in large areas of the bottom of the pools becoming unavailable to aquatic life, for most of the time. In addition there is severe anaerobic condition of all water deeper than 2 m, in the lower reaches of the river during summer. The Wimmera-Mallee Pipeline consisting of 9,000 km of pipeline should be completed in 2010. This will save about 103,000 ML/year and allow increased environmental flows to be provided in the Wimmera River as well as four other river systems. This will increase the area of the river available as fish habitat by improving water quality over large areas of the pools and flooding substrate which is now usually dry. It will also increase the frequency of flows to the terminal lakes. It should result in a significant improvement in abundance and distribution of fish in the Wimmera River. The width of the river averages 31 m but can be as narrow as 6.5 m in riffles and up to 180 m wide in pools. Pools vary in depth from 1.25 m to 10 m with an average depth of 3.7 m. The most significant feature is the large number of deep, permanent pools which are spread along the entire length of the river (including upstream of Horsham) and which make up 70% of the channel. Pools have mostly clay, silt and some sand substrate. Runs have clay or sand bottom while the shallow riffles have a sand or gravel/rubble and rock bottom. There is generally good riparian vegetation of river red gum woodland and open forest along most of the river except near Jeparit upstream of Lake Hindmarsh. Cumbungi and particularly canegrass are widespread. There is instream woody habitat of single logs or log-jams along most of the river. Snags are particularly abundant downstream of Polkemmet, because of large trees growing along the bank in the Wail Forest/Little Desert National Park area. Twenty fish species have been collected from the river but only five (river blackfish, Australian smelt, mountain galaxias, flathead gudgeon and southern pygmy perch) occur naturally in the Wimmera River or its tributaries. Large numbers of Murray cod, golden perch, freshwater catfish, Macquarie perch and silver perch have been introduced by stocking, since 1910. Golden perch and Murray cod are widely distributed downstream of Horsham. Freshwater catfish are now self-sustaining with good numbers present downstream of Horsham. Macquarie perch have not established a self-sustaining fishery. The most successful introduced fish are redfin, goldfish, European carp, tench and eastern gambusia, which are abundant and widespread. Brown trout occur in areas of suitable habitat in the upper reaches. Western carp gudgeon, congolli and southern shortfin eels have been reported but are very rare and may have come from the Glenelg River. 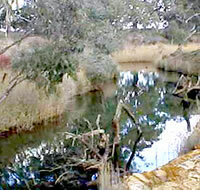 In this river, a six metre long bait net can be used by licensed recreational anglers downstream from the bridge on the Stawell- Marnoo Road (upstream of Glenorchy) to Lake Hindmarsh to take bait. As part of the Victorian River Health Program, DSE has carried out surveys of fish populations to determine habitat requirements of selected species, at different flows. This data will be used to determine the type of habitat restoration work required. There is extensive river improvement work in the Wimmera River and Mt Cole Creek upstream of Elmhurst, also part of the Victorian River Health Program. Willows are being removed in this section of the river as well as in Glenpatrick Creek and Shepherds Creek. There is also major work to control erosion in the catchment. This will reduce downstream sedimentation and improve water quality. There has also been an assessment of the ecological condition and health of the Wimmera River valley as part of the Sustainable Rivers Audit (see Introduction in the Guide). A fish monitoring program commenced in 2006/07 to evaluate the impact of environmental flows and sustained droughts of aquatic biota. The river flows for 100 km through farmland and scrub. Width is less than 40 m and the upper reaches normally stop flowing during summer. Permanent habitat is maintained in deep pools and several Weirs (Glenorchy, Huddlestone and Horsham). Carries mostly redfin to 1.8 kg, tench, European carp, and occasionally river blackfish and brown trout in the upper reaches (trout having entered the Wimmera from its upper tributaries, Burnt Creek and the McKenzie River). Freshwater catfish, redfin and golden perch are common in the Horsham Weir Pool, (at Horsham) which provides the best fishing in this section of the river. Freshwater catfish are allowed to be taken from waters within this Basin. Stocked with golden perch in the Elmhurst/Greens Creek area and at Glenorchy. Fish species recorded in this 60 km section of the river are European carp, golden perch, freshwater catfish, goldfish, eastern gambusia, abundant redfin, Australian smelt, flathead gudgeon and the occasional Murray cod. There is good fishing for redfin and freshwater catfish at Dimboola. 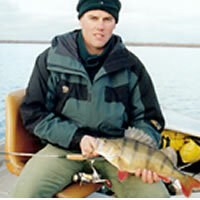 Carries good numbers of golden perch that are stocked by Victorian Fisheries Authority. Dries to a series of pools during summer but these retain permanent habitat. Stocked with golden perch and silver perch at Horsham (2009) and golden perch at Jeparit. The river runs 35 km to the lake. Access can be difficult after rain because of the resultant slippery dirt roads. Contains mostly redfin to 1.6 kg, abundant freshwater catfish downstream from Dimboola, golden perch, abundant European carp, tench and a few Murray cod at Antwerp. Best fishing is in the Antwerp and Jeparit Weirs. Stocked with golden perch and silver perch at Dimboola and golden perch at Elmhurst (2009). In November 2009, stocking recommenced in some parts of the Wimmera River for the first time in a number of years due to good rain and water savings delivered from the Wimmera Mallee Pipeline Project. This will involve the stocking of 50,000 golden perch at Dimboola (last stocked in 2006) and Horsham (last stocked in 2007). Surface area varies from 1.4 ha to 100 ha. 1,850 ML. A popular area for picnicking, swimming and boating. There are several distinct waters which combine to form one lake when the water level is high. The southern lake is surrounded by grazing land and is usually the only permanent water. Carries a few redfin to 400 g and golden perch to 4 kg. It was stocked unsuccessfully with trout in the 1960s and with Murray cod in 1972. Flows through scrub and grazing land into Lake Coorong, mud and clay bottom. Best fishing is in the Warracknabeal area. Redfin, tench and golden perch can be taken in the deeper pools. Stocked regularly with golden perch when water conditions are favourable.